I’m a cancer survivor with celiac disease and I’m living without a stomach since Jan 2018. I was given a choice: 1) monitor the situation and get scans/scopes/biopsies a few times a year to try and “catch” cancer early, or 2) have a prophylactic total gastrectomy (total removal of the stomach). The end goal: Live a very happy and long life. I didn’t like either option, to be honest, but option two seemed to have the best chance for me living a long life. It is also the recommendations of doctors familiar with this disease. I created this blog to document my journey. Others in my situation have done the same, and I found it very encouraging as I tried to learn about my disease. I’m hopeful I can pass the torch. I had surgery on January 6, 2018. The Surgery was performed by Dr. Yoon in NYC at Memorial Sloan Kettering. My goal is to encourage others with HDGC/Stomach Cancer and their caregivers as I fight to live the best life possible without a stomach. Since surgery, I’m able to eat some of my favorite foods like sushi, Thai, Indian, and Mexican. 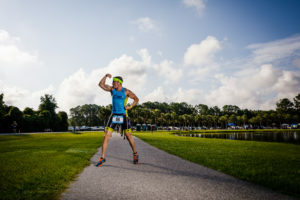 I learning how to be active again, but I am able to still compete in Triathlons and have plans to do marathons and full Ironmans in the near future.